The latest visit to Carnoustie took place recently with the arrival of a group from Maule and Aulnay who landed at Edinburgh on Friday 11th. Once clear of the airport they spent the remainder of the day seeing some of the sights in the capital. The picture on the left shows the group at Edinburgh Castle. Later in the afternoon they were picked up and continued to Carnoustie where they were greeted by their hosts and settled in for a meal and the rest of the evening spent relaxing. The group included visitors who have been here before and some who were on their first visit. New faces are always particularly welcome and soon all were putting their feet up after their journey. On Saturday it was a day with hosts and for most a chance to see around Carnoustie and surrounding area. Later there was a gathering at the Caledonian Golf Club in Carnoustie for a social evening with music and dancing. This was also an opportunity for those not actually hosting to meet and greet our visitors. A good time was had by all. Sunday saw another day with hosts and a chance to see the east coast area a bit further afield for some but closer to home for others and chances to to catch up with old - and new - friends in Carnoustie. Monday saw the start of a three day visit to the west coast to stay in Oban and visit The islands of Mull and Iona. The group set off bright and early and arrived in Oban mid afternoon for lunch before checking into a hotel for the stay. The weather appeared to look like being kind and indeed it was with clear skies and sun! This was very lucky as one of the locals said, "up to yesterday the weather here has been lousy for about the last 10 days". So the sun shines on the righteous right enough. 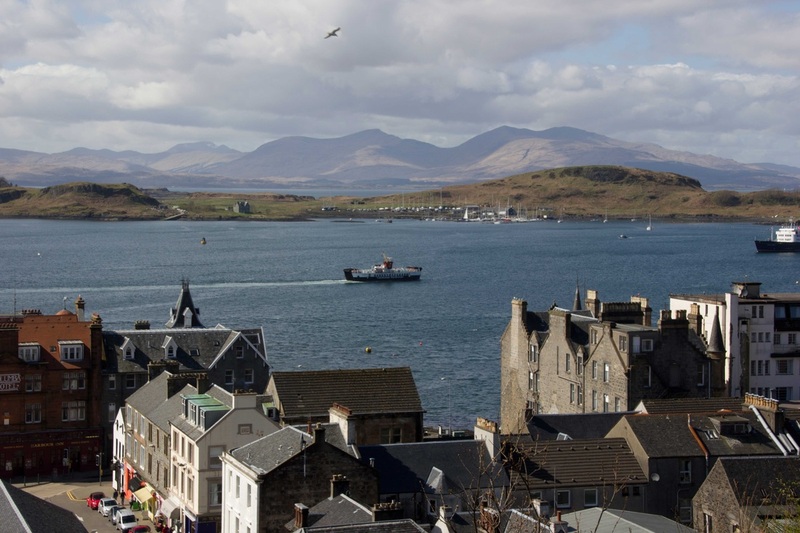 The picture below shows the view from Oban across to the hills of Mull. These pictures show some of the views at Oban and on Mull and Iona. The journey from Craignure where the ferry lands on Mull to Fionnphort -where the ferry runs to Iona - is very spectacular even though it is single track road. There is a short walk from the landing to the iconic abbey which cannot fail to impress the visitor mostly by its history. The afternoon was spent there until it was time to return to Oban. The following day the party made its way back to Carnoustie via Glen Coe and Killin where a lunch stop was made by the Falls of Dochart. On Thursday the French party went to Dundee for some retail therapy and visits to see Captain Scott's ship 'Discovery' and the 'Unicorn' the oldest Royal Navy ship afloat. A number of the French party are involved with the Camera Club in Maule and they paid a visit on Thursday evening to the Carnoustie Photo Group where ideas were exchanged. There have already been photos sent to Maule for their latest exhibition and some French photos will figure in the forthcoming Carnoustie exhibition in August so that is another contact opportunity made. On Friday It was a visit to Barry Mill to see a working water mill in action before a picnic at the beach before departure back to Edinburgh airport to return to France. Another great visit enjoyed by all.